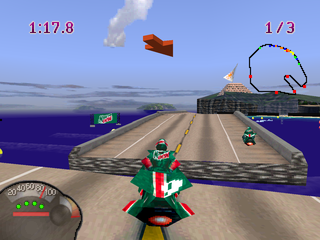 Jet Moto is a racing game with hover bikes! Think Wave Race but instead more flying in the air! That's Jet Moto for you. We have here a racing championship to see which sponsor's racers are the best of the best. With ten crazy adrenaline pumping race tracks to cruise through, this intense 30 racer competition is Sony's answer to Wave Race 64. With realistic physics and interesting game mechanics like Boosts and Magnetic Grappling, Jet Moto rides the waves nice and smooth with an amazing soundtrack to go along for the ride. So why not hop on? Just try not to look down. Now you can add videos, screenshots, or other images (cover scans, disc scans, etc.) for Jet Moto [NTSC-U] to Emuparadise. Do it now! If you haven't noticed yet, we have a retro game of the day feature (top-right of the screen) wherein we feature a new retro title every single day! Now, you can vote for your favorite games and allow them to have their moment of glory. Click on the button below to nominate Jet Moto [NTSC-U] for Retro Game of the Day.